We have been saving this gem of a wedding, because we knew that Wedding Bells had it marked for a feature on their website, and woot – here it is! Every once in a while a rainy day wedding comes along that steals my heart. Kirsty married Euan on just such a day. As a wedding photographer, I am used to working in just about any condition, and I am yet to figure out just why rainy day weddings speak to me so sweetly. The soft light, the snuggling under umbrellas, the sheer silliness of photos in a downpour. I love every soggy second. Not every couple is willing to embrace an opportunity to play in the rain on their wedding day. A huge thanks to Kirsty & Euan for their sweet wedding style, and for having the spirit to embrace the oh so perfectly Scottish weather for their Canadian wedding day. I met my husband while working in Scotland during my last year of university. We dated long-distance and in 2011 he came here on a working visa. When we went to a lawyer for advice on what to do once his visa expired the lawyer looked at us like it was obvious, “get married,” she said. He proposed on July 4th in Scotland and we chose Thursday, August 9th (in Canada) as the date. We went with a Thursday because we knew our tight timeline wouldn’t make it easy with bookings. When planning the wedding we knew we wanted to keep things simple, very personal and intimate. We had family wedding photos from both sides on display (his mum and dad flew over with them in their suitcases) and my parent’s mailbox from their old farm house was turned into our card box. Everything in our wedding was a community effort, from my mum and grandmother making homemade fudge for favors, to my mum’s co-worker sewing the tartan table runners, to my sister’s tree painting that we turned into our guest book, to our neighbours all bringing over their kitchen chairs for the ceremony. 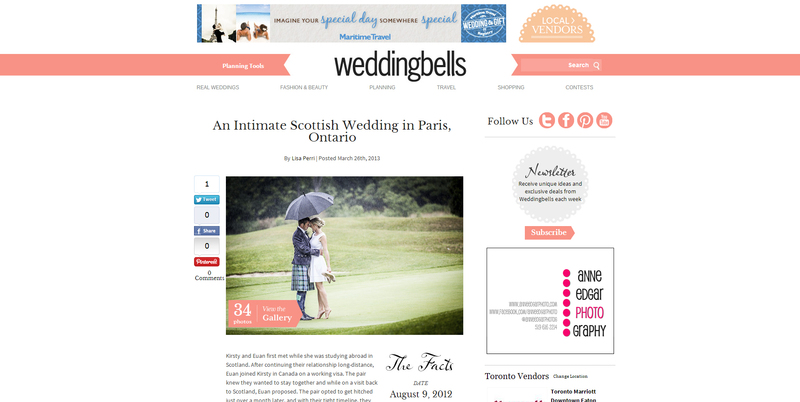 We also wanted to make sure the Scottish connection was prominent so flags from both countries were used throughout the day, tartan ribbon was used on my bouquet and our cake and of course, the men wore kilts. I knew I wanted to be married in the backyard of my childhood home on the street I grew up on, and with the beautiful summer we were having I didn’t think I’d need a rain plan.The weather gods seemed to have other plans though as we woke up to heavy rain and grey skies on the 9th. My dad immediately went to work cleaning the local stores out of every umbrella they had and visiting the local hardware store to buy a huge tent. Thankfully the rain held off for the ceremony and our minister stayed dry as he read letters that my husband and I had written to one another as our vows. It was very intimate with everyone gathered around the back deck; a celtic harpist played throughout the ceremony and a bagpiper piped us to the front of the house afterwards.